Herring is the flesh of a fatty fish from the shallow waters of the northern Atlantic or Pacific oceans. It is a part of the family of Clupeidae (order Clupeiformes). Herring can either be the Atlantic herring (Clupea harengus harengus) or the Pacific herring (C. harengus pallasii). Herrings are small-headed, streamlined, colored fish with silvery iridescent sides and deep blue, metallic-hued backs. Adult herring range from 20 to 38 centimeters (8 to 15 inches) in length and they can grow 1.5 feet long. They live up to 19 years and can inhabit fresh as well as salt water. Herring feeds on organisms such as copepods, pteropods, planktonic crustaceans, and fish larvae. Herring offers several health benefits, which is major factor driving growth of the Smoked Herring Fish Market. It has high levels of heart-healthy omega-3 fatty acids, essential fats that also play an important role in normal brain development and function. Studies carried out by the U.S. National Library of Medicine omega-3s help regulate inflammation and reduces the risk inflammation-associated disorders including heart attack, stroke, cancer, and autoimmune diseases such as rheumatoid arthritis. Furthermore, its provides benefits to patients suffering from high cholesterol, diabetes, symptoms of PMS, coronary artery disease, breast cancer, memory loss, depression, attention deficit hyperactivity disorder, insulin resistance, and arthritis. These are the major drivers for growth of the Smoked Herring Fish Market. However, the stringent government regulations with regards to the packaging of smoked herring products that includes proper lebelling and approval of the regulatory bodies amongst others is a major restraining factor for market growth. Since 2014, smoked fish from Nigeria is marketed in the U.S. with the help of the Commercial Agriculture Development Project (CADP), supported by the World Bank. Through CADP, Nigerian farmers were introduced to new smoking kiln technology that improved fish processing by reducing the smoke level to internationally acceptable standards. Such technological advancements are expected to drive the growth of the market. Vendors in the smoked fish market are also investing in using biodegradable packaging materials such as bio-PET amongst others to increase the shelf life of the smoked fish products and to avoid the harmful effects of packaging solutions in the environment. Europe is expected to hold dominant position in the Smoked Herring Fish Market and is expected to continue its dominance during the forecast period. 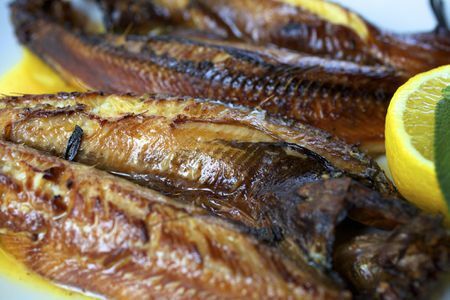 In Europe, majority of the smoked herrings are salted, pickled in barrels, or cured by smoking and sold as kippered herring. In eastern Canada and the northeastern U.S., most of the herring utilized are young fish, taken in inshore weirs or seines that are canned as sardines. Majority of herring obtained from Pacific Ocean are used to manufacture fish oil and meal and smaller quantities are pickled and smoked. Herring is placed in smokehouse are smoked at 80-90° F (27-32° C) for one hour to dry the skin and obtain golden brown color. Market players are engaged in manufacturing new products with smoked herring in order to maintain leading position in Smoked Herring Fish Market. Herring is preserved by using various methods such as smoking or salting. Also, key players offer herring prepared from using Eastern European methods, which is propelling demand for Smoked Herring Fish Market. For instance, Gold Star Smoked Fish offers finest Eastern European specialty foods and exquisite smoked fish crafted using authentic Eastern European methods. Key players operating in Smoked Herring Fish Market include Zila Laguna, TSIALIOS, Gold Star, Empresas AquaChile SA, Faroe Seafood, Findus Group, Hansung Enterprise, Kverva AS, Labeyrie Fine Foods PLC amongst others. Coherent Market Insights is a prominent market research and consulting firm offering action-ready syndicated research reports, custom market analysis, consulting services. Kommentar hinterlassen on "Smoked Herring Fish Market – Quantitative Market Analysis, Current and Future Trends"